"^^Dimensions of Moral Theory "examines the key presuppositions and philosophical commitments that support and shape moral theories. - Publisher Preface. Acknowledgments. 1. Objectivity and Subjectivity. Interpretations of Objectivity. Monism and Pluralism. This Way to Subjectivism. Subjectivity and Sentiment. Subjectivism and Skepticism. Relativism. Where Now?. Questions for Discussion and Reflection. Thinkers and Their Works and Further Reading. Notes. 2. Moral Theory and Moral Psychology. Moral Motivation. Virtue and Motivation. Self-interest and Morality. What about Luck?. Are Moral Considerations Overriding?. Where Now?. Questions for Discussion and Reflection. Thinkers and Their Works and Further Reading. Notes. 3. Forms of Moral Theory. Consequentialism. Kantian Non-consequentialism. Intuitionist Non-consequentialism. The Virtue-centered Approach. Contractarianism. Theories, Duties, and Metaethics. Where Now?. Questions for Discussion and Reflection. Thinkers and Their Works and Further Reading. Notes. 4. Naturalism and Non-naturalism. Naturalism. The Modern Debate about Naturalism. Reconstructed Naturalism. Non-cognitivist Alternatives. Hume and Naturalism. Reconnecting Facts and Values. Aristotle and Naturalism. Moral Facts and Explanation. What About God?. Where Now?. Questions for Discussion and Reflection. Thinkers and Their Works and Further Reading. Notes. Conclusion. Glossary. Bibliography. Index. 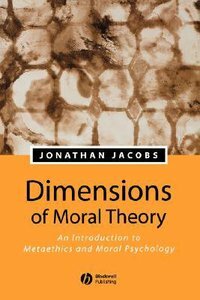 About "Dimensions of Moral Theory"
Preface. Acknowledgments. 1. Objectivity and Subjectivity. Interpretations of Objectivity. Monism and Pluralism. This Way to Subjectivism. Subjectivity and Sentiment. Subjectivism and Skepticism. Relativism. Where Now?. Questions for Discussion and Reflection. Thinkers and Their Works and Further Reading. Notes. 2. Moral Theory and Moral Psychology. Moral Motivation. Virtue and Motivation. Self-interest and Morality. What about Luck?. Are Moral Considerations Overriding?. Where Now?. Questions for Discussion and Reflection. Thinkers and Their Works and Further Reading. Notes. 3. Forms of Moral Theory. Consequentialism. Kantian Non-consequentialism. Intuitionist Non-consequentialism. The Virtue-centered Approach. Contractarianism. Theories, Duties, and Metaethics. Where Now?. Questions for Discussion and Reflection. Thinkers and Their Works and Further Reading. Notes. 4. Naturalism and Non-naturalism. Naturalism. The Modern Debate about Naturalism. Reconstructed Naturalism. Non-cognitivist Alternatives. Hume and Naturalism. Reconnecting Facts and Values. Aristotle and Naturalism. Moral Facts and Explanation. What About God?. Where Now?. Questions for Discussion and Reflection. Thinkers and Their Works and Further Reading. Notes. Conclusion. Glossary. Bibliography. Index. Jonathan Jacobs is Professor of Philosophy and Chair of the Department of Philosophy and Religion at Colgate University. He is author of "Practical Realism and Moral Psychology" (1995), "A Philosopher's Compass" (2001), and "Choosing Character: Responsibility for Virtue and Vice "(2001). questions For Discussion And Reflection. thinkers And Their Works And Further Reading. 2. Moral Theory And Moral Psychology. 3. Forms Of Moral Theory. the Modern Debate About Naturalism.